Myopia or nearsightedness is a common refractive error caused by either an excess of power in the eye and/or a lengthening of the eye. This excess of power or lengthening of the eye causes light to focus in front of the retina causing blur to things that are at a distance. This is easily correctable with both glasses and contact lenses. 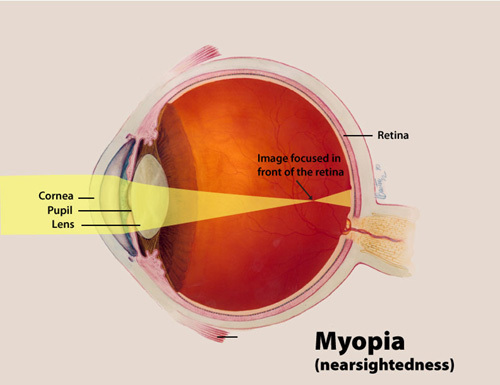 Myopia is also eligible for refractive surgeries such as Lasik and clear lens exchange. Be sure and ask Drs. Folwarski and Hayes any questions you may have about your options during your comprehensive eye examination.